…You see, Mrs Baker, I received a postcard from my husband in August but it had taken a year to come from the time of writing and he was fit and well then, next came the War Office communication confirming that he was a P.O.W. [more than a year after he went missing]. While devastating for this family, this information may have given false hope to others, thinking that if they had heard nothing their men were still alive and well. Phyllis, still without any direct communication from Barry since early 1942, keeps sending the brief permitted typed slips. This one, sent in January 1944, miraculously reached Barry 9 months later. Sometime later in January 1944 Phyllis had her moment of hope, a POW card from Barry reached England. 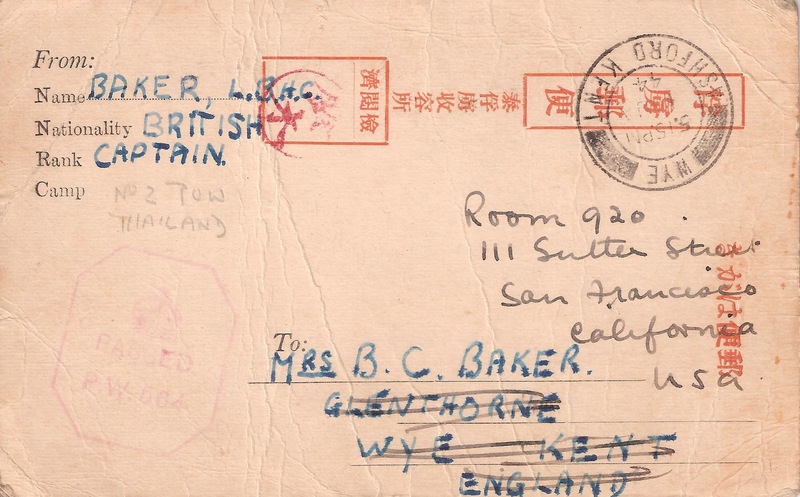 This was addressed to his parents house and the Post Office readdressed it across the Atlantic to Barry’s parents in San Francisco, where they were broadcasting to the Far East in Malay. This small card, having traversed the globe, reached Barry’s parents who then cabled Phyllis with the good news. Phyllis was now among the lucky ones, she sent another slip to Barry. And she shared her joy with the other relatives of 27 line section. 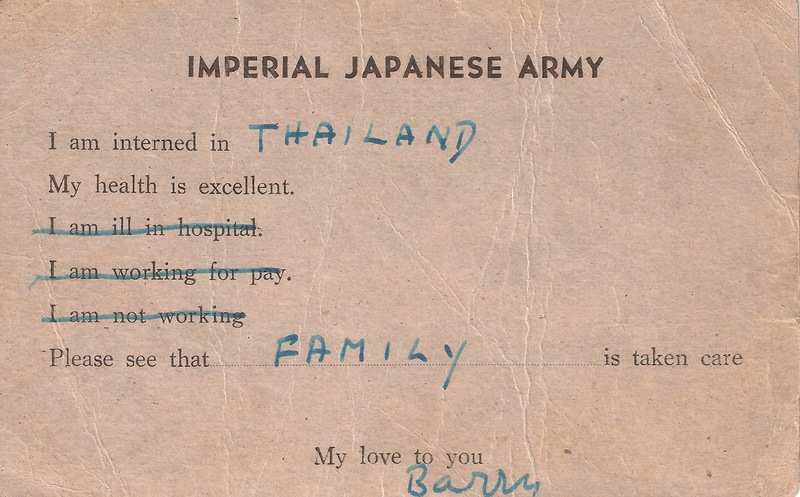 This reply, from the wife of one of the men who saved Barry’s life nine months earlier, shows that by now relatives are at least partially aware of the bad treatment of Far East POWs. Things seem to be moving a bit now, with the Japs getting a foretaste of what’s to come, so maybe a few more blows will make them decide that better treatment of their prisoners would be beneficial. Also that twenty-five words included the date, which I had not known, so I’m hoping, that my previous notes, have got through. I was most interested to hear that you have a small son Mrs Baker, as I am very fond of children, and having one of my own, I know what a comfort he must be to you. My little boy is nearly seven, and it’s due to him that I kept going during the long period which his daddy was posted as missing. It will be a wrench parting from him to take a job, but in the circumstances I think it would be best for you and will help to keep you from worrying. Often I have wished I could take a job myself, but having my father and sister to look after, (they are doing important work) along with my son, I seem always to have plenty to do. I don’t think any more mail has arrived from the Far East since December, and although it’s unlikely that another postcard will arrive for a time, I’m just longing to hear that the men have received some mail from home. Badly off as we think we are, it’s so much worse for them, not knowing how things are at home or how their dear ones are faring. Your father-in-law’s remark that the government hasn’t just let things slide, is very heartening, since he is in a position to know, so it’s up to us to be as brave and patient as our men, and who knows, it might not be too long before they return, when we will be able to make up to them a little for what they have gone through. Hoping this finds you and your little son well and happy. 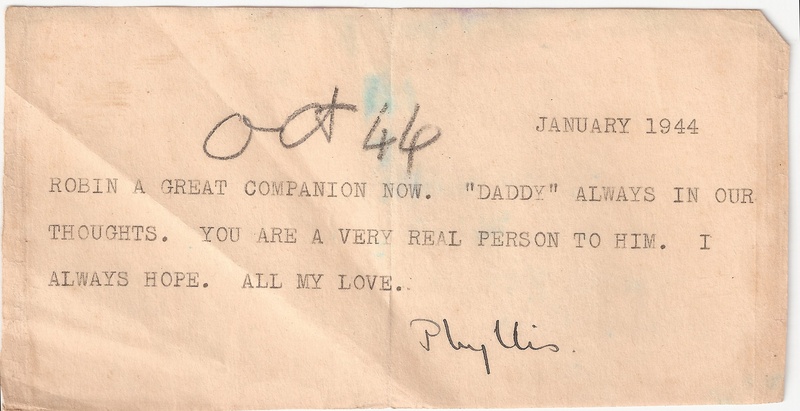 In late 1944 this correspondence that Phyllis kept up with the relatives became crucial when some Far East prisoners were rescued after the sinking of a transport ship. This entry was posted in POWs, Writing notes and tagged Far East POWs, Researching FEPOW History, writing, WWII by hilarycustancegreen. Bookmark the permalink. Heart wrenching . So much hope vested in just a few words. Amazing bit of history. Thanks for posting it. Yes, the tiny slips are some of the most poignant communications. I have access to about 200 more letters to Phyllis from these relatives. Some are short and formal, others are heart-breaking outpourings. I will be posting some more at a later stage in the story.